Test your street smarts with this wooden puzzle that displays an aerial view of the address you choose. 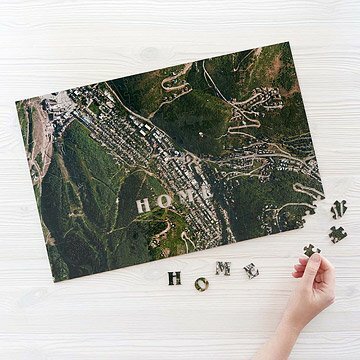 You'll feel on top of the world as you piece together this 300-piece puzzle, featuring a satellite image of your home sweet home. The custom photo—printed on thick European birch plywood—gives you a bird's eye view of your neighborhood, with your house at the center. Taking a page from traditional Victorian craftsmen, there are 15 specially shaped "whimsy" pieces: Our favorites are the letters H-O-M-E, and the house-shaped one that represents yours. The puzzle comes packaged in a velvet pouch and book-inspired box, so it makes a good-looking housewarming gift or coffee table topper. Made in the United Kingdom. Please note: moving water will appear blue in satellite images. Still water will appear green. I think it's a cute idea, but I guess I didn't realize that not all neighborhoods are very picturesque. Still a great idea. Scale far too small. Visually unappealing. Grey. Incredibly disappointing. The scale translates to a customized city puzzle that is 22 blocks by 18 blocks. An birds eye view of an an area that large just looks like blocks and blocks of grey where you can barely make out a house roof. We thought we would be able to identify neighbor housetops and our own... that's impossible. Novel idea! Great puzzle and piece of geography all in one! Great for the puzzle enthusiast! I love getting unique gifts for my clients. This puzzle is especially great for clients that are moving into the city. Unfortunately, the satellite picture is too repetitious. It will be close to impossible to complete this puzzle. The quality is excellent though. It would have been extremely beneficial to have an option to view prior to purchasing especially given the cost. I was disappointed in the view. It is so high that the only way I could determine the address requested was that it was located next to a football field. Houses/buildings were not visible. This was a going away gift, to be a memory of the time spent at this location, but it was disappointing that the view did not really show the requested area visibly. For the price, expected better. Took longer than was described, but the recipient said she loved it and was the most unique and "cool" gift. The web page gives an impression of providing some proximity to the address/neighborhood. The satellite photo we received was so distant that we couldn't even distinguish the location of our house. I work away from my family for the majority of the year, and this was supposed to be something special to let them know I was thinking of them. They appreciated the thought, but the product, especially for the price, was extremely disappointing. Not sure what goes into vetting the quality of the photo/representation, but we're not impressed. The packaging is lovely and wood pieces are nice, however; too bad we have no desire to display the finished product. Good idea for a product, but not a sure thing on the deliverable. This was a gift for my parents. They do like it and say the quality is impressive. However they received a street map puzzle, rather than a satellite image puzzle. So it's not quite what I was intending, but they still enjoyed receiving the gift.